I’m not sure what you’re doing or how your day has gone, but I’m pretty sure whatever’s going on will be made better by just looking at this ad for this beautifully-realized Volkswagen-powered Isetta truck. Holy crap, that thing looks fantastic. The ad is on Bring A Trailer right now, where the current bid is a quite reasonable $8750 as of this writing. 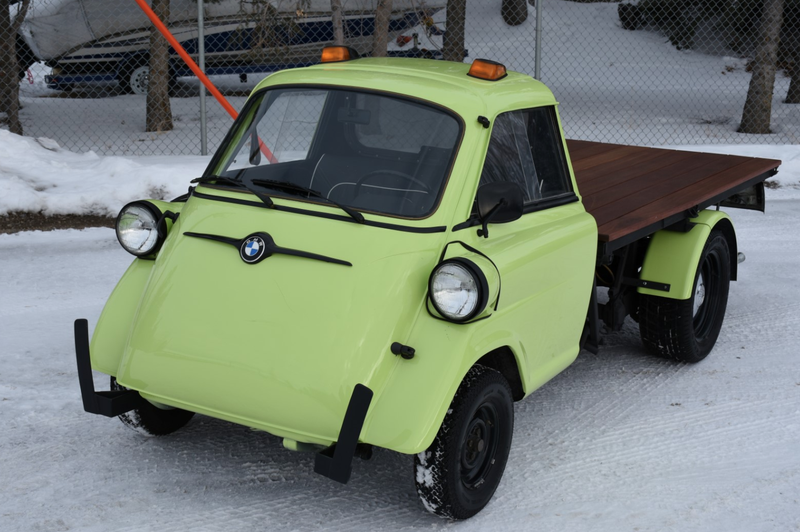 The little truck actually seems to be made from the front half of the Isetta’s slightly bigger brother, a BMW 600, with a custom-built wooden flatbed out back. The VW power (really, a whole VW rear end) for this thing is interesting as well—it’s not just your normal Beetle engine slapped in there, the person who built this thing really thought it all through and is using a 1600cc Type 3 engine, a much better choice for this application, since it’s about half the height of the usual Type I engine, which allows for a lower and more usable truck bed. Also from the VW parts bin are the pair of ‘71-’79 U.S.-spec Beetle turn indicators, on the roof. The reason this thing appears to be built so well and looks so damn good is because it was built by a BMW master technician who used to work at the BMW plant in Munich, Germany. The builder moved to Canada and opened an Isetta-specialty shop, and decided that, since he needed a good shop truck, he may as well build himself a very cool Isetta-like shop truck. The switch to VW power was a good move, since the stock BMW twin-banger that originally powered the 600 only gave about 19.5 horsepower, and a Type 3 engine like this should be good for around 50 or 60 hp. A nice bump. The lovely deck is made of Brazilian Balau wood, whatever the hell that is, and the whole bed lifts for engine access, even splitting the rear fenders as it lifts in a way that’s so satisfying it makes me feel a little funny in my netherwhatsits. What are these taillights from? It’s on the tip of my brain, but I can’t quite get there. I’m almost sure it’s Japanese, Toyota or Datsun, from the late ‘70s or early ‘80s? It’s driving me nuts.